In Les Sonneurs du Roi - Les Tambours - Centre Panel tapestry we see a piece based on the work of Charles le Brun (1619-1690). Here we royalty on horseback on a hunting scene. As a part of the larger work Les Sonneurs Du Roi, this work shows daily life under the rule of King Louis XIV, a most prominent promoter of the arts and its advancement in France in that era. 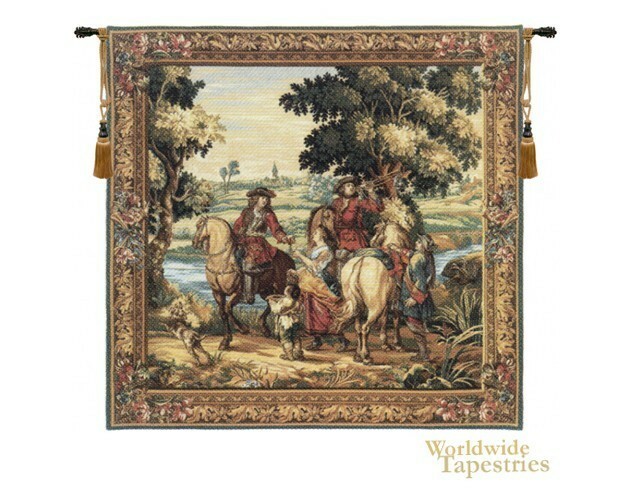 This Les Sonneurs Du Roi - Les Tambours - Right Panel tapestry is backed with lining and tunnel for easy hanging. Note: tapestry rod and tassels, where pictured, are purchased separately. Dimensions: W 48" x H 48"